The Select 640 Doser Model is ideal for use in situations where a larger output is required. The same range of products can be dosed as with the Select-480. The Select 640 Doser is a unique and innovative water dosing system designed for use in agricultural and other situations where products including vaccines, vitamins, minerals, chlorine, soluble fertilizers or other solutions are dispensed into water proportionately to the flow. 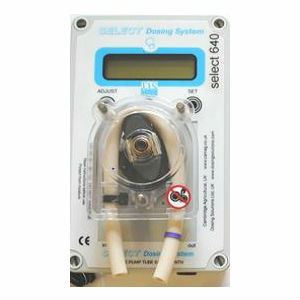 The Select Doser helps take the guesswork out of water consumption to help you better manage your dosing system. The Select 640 incorporates a powerful motor and gearbox to give reliable and trouble-free performance. Using a computer programmed peristaltic pump, the Select Doser compresses a soft tube to move solutions into watering systems. It accurately and uniformly administers the proper water/product ratio. Select Doser performance yields highly accurate dosages all the time. Accuracy is 95+ percent, superior to more variable water or electric pumps that can wear out, especially if dispensing aggressive materials. Precise dosing results in fewer health problems and faster gains in animal operations. Long lasting with minimal maintenance required. Unclipping the used tube and inserting a new one effectively renews the pump. A series of simple on-screen menu commands allow the operator to choose between a numbers of pre-set allowable dosing ratios. The standard range is between 1:20 (5%) and 1:40,000 (0.0025%) in 15 stages covering all of the normal dosing ratios. A single pump tube size is used for all dosing ratios. Additional tube sizes can be uses for specialist applications. The correct tube to use is indicated onscreen. You have the option to customize and add additional ratios to meet your needs (no extra charge).